Once again this year, we are hosting a great two-day event series for College Royal! the connection between garden and table. Check out our ad in the College Royal Booklet. Our event for College Royal will continue food education for children and families in Guelph by providing a wide variety of events for people to participate in. 1. 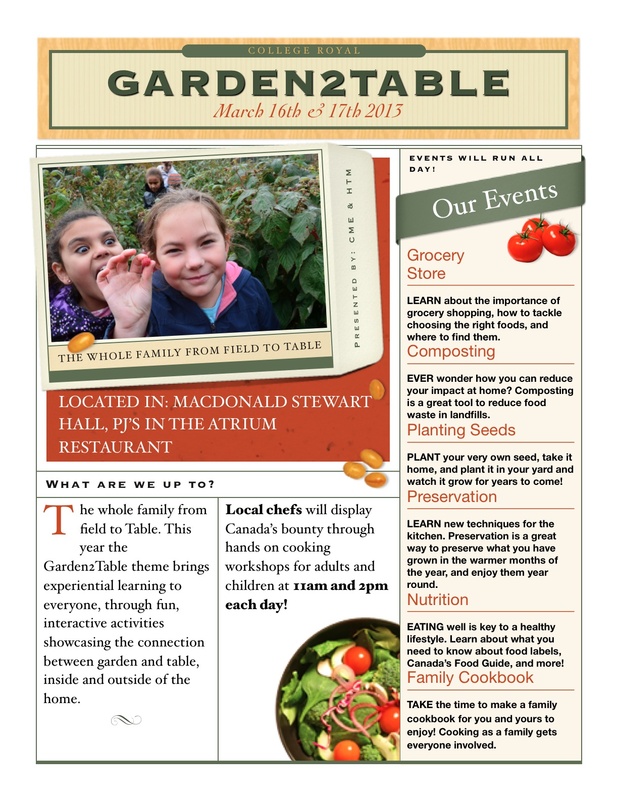 Grocery Store; we will set up a grocery store style display that families can walk through with the Canada Food Guide and choose the foods they would eat for a day from the “aisles” of the store. 2. Composting; a display that walks participants through methods of composting, how it works, and how they can implement into their homes. 3. Planting Seeds; growing a garden is a great way to continue education of food at home, and brings everyone back to the “roots” of where food comes from. 4. Information display for GCUOF; the GCUOF is a huge part of our programming and we want to educate the community about what they do. 6. Preserves and Preservation Methods; growing your own fruits and vegetables in the summer is excellent, but having them around in the winter can be challenging. We will showcase different recipes and methods for making preserves, including jams and sauces. 8. Family Cookbook making; relating back to the cookbook activity we do in the fall, we will have a family cookbook making station set up with several recipes to chose from. 9. Celebrity Chef Demonstration; we will have two sessions each day showcasing the talents of a celebrity chef that families and people in the community can watch and then try the recipes themselves under the guidance of the chef. Hope to see out this weekend!